Bob: So, where did this interest in D-Tuners begin? Bill: The first tune on my first Earl Scruggs record (“Foggy Mountain Jamboree”), which I bought in 1957, is “Flint Hill Special.” That was the first time I ever heard someone changing the pitch of a string while they were playing. It caught my attention right away and I tried to understand how that was being done. There are several other tunes (“Earl’s Breakdown,” “Foggy Mountain Chimes,” and “Randy Lynn Rag”) in which he also D-tunes and re-tunes while playing. Earl told me that when he recorded “Earl’s Breakdown” he had not yet developed a tuning device, so he turned the 2nd string tuning peg by hand. If you listen carefully, you can hear him retune while the rest of the band is playing. But, after recording it, he decided to add a separate peg that would enable him to change the pitch of the 2nd string so he could play “Earl’s Breakdown” more accurately and consistently. Shortly thereafter, he added another peg for the 3rd string and used both tuners for the other D-tuner songs on that “Foggy Mountain Jamboree” album. People called these extra pegs – ‘cams’, ‘cheaters’, ‘winders’, ‘twisters’ or ‘Scruggs Pegs.” Some players like Don Reno just reached up on the peghead and pulled on the strings when he wanted to raise the pitch. 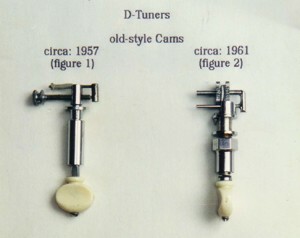 Since these special pegs were not available commercially, besides Earl, many people made their own versions of cam tuners. Some were crude and rudimentary. The two you see in figures #1 and #2 are two of the better examples. Bob: Why this general interest in note changing in the first place? Bill: As I understand it, changing notes while playing really began with the steel guitar. In 1955, an adventurous steel guitar player added a pedal to his guitar to change the tuning while he played. The song “Slowly” was the first recording that used this new pedal on the steel guitar. When Earl heard that recording he was inspired to apply the concept to the five-string banjo and he built his cams for that purpose. That’s when he wrote those instrumentals for his “Foggy Mountain Jamboree” album. There is a funny story about all of this. Earl installed his original cam for the 2nd string (to play “Earl’s Breakdown”) in the middle of his peghead. So, when he decided to add another cam for the 3rd string, he had to take out the original cam, fill up that hole and install two new ones, drilling separate holes for each. In the process, pearl inlay was chipped and the peghead began to look messy. So, to make things look neater, he took off the cover from the light fixture of Louise’s floor polisher and used it to cover that area of his peghead. You can see it on the album cover of “Foggy Mountain Jamboree.” Some people thought he was trying to conceal his mechanical device under that cover. But, he told me, he was simply trying to make it look better. Bob: Were you also using tuners? Bill: Shortly after hearing the “Foggy Mountain Jamboree” album, I had built a crude set of cams just to play those tunes. By the time I went to Nashville to work with Earl on his banjo instructional book, in early January of 1963, I had some better cam-style tuners. By then, Earl had met a fellow named Walt Pittman, in California, who built him a more precise set of cams than the ones Earl had built himself. Walt also replaced Earl’s finger board with new frets and inlays. During my first months with Monroe, I went back to Boston on several occasions for remaining military commitments and also to visit with my family and friends. One friend from college, Dan Bump, also played banjo, and like me, enjoyed figuring out how things work. In one of those visits, Dan and I talked about going into the banjo business in some way. At first, Dan wanted to make high-tech banjos with aluminum rims, cast fiberglass necks and other modern materials, but I wasn’t sure how receptive the market would be for that kind of banjo. People seemed to like the traditional materials and techniques. So, we decided to re-engineer the cam-style tuners. Having to drill holes was a big objection to the cam-style tuners. A lot of people don’t want to drill holes in a fancy pearl inlaid peghead which would weaken it if not done properly. Another objection was their accuracy. 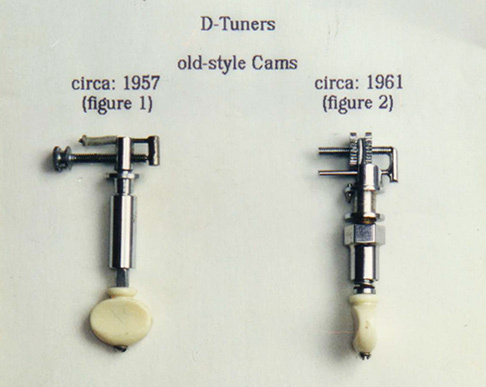 Many of the cam-style tuners were better than turning a tuning peg by hand, but still not very precise. So, after three or four hours of sketching out ideas on a legal pad, one afternoon, we arrived at the design of a new type of tuning peg. Essentially, we had combined the function of a standard tuning peg with the d-tuning function — all within the regular tuning peg housing. It would no longer be necessary to drill extra holes through a beautiful peghead to install the cam-style tuners. Figure #3 is a present day model of our design. Bob: So, how does it work? Bill: Looking at figure #8 you can see all the parts. You can see the planetary gear set that is in the upper part of the housing — the sun gear in the center, the 3 planet gears which move around it inside the ring gear, which is part of the housing. Since the sun gear and planet gears have the same number of teeth, the gear ratio is 4 to 1. Below the planetary gear set are the parts that make the d-tuning possible and are the key to our design. 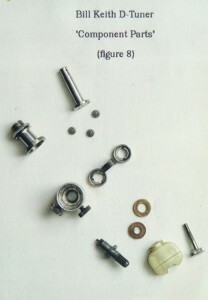 In the right-center part of figure #8 you can see the two discs and the small spring that connects them. 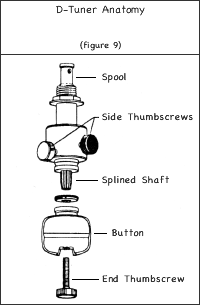 Outside the housing (figure #9) are the two thumb screws. Each one locks one of the disks, which set the high and low notes. Then, once you have set your high and low notes with the thumbscrews, you can change your tuning knob to a convenient angle and set the friction by adjusting the end thumb screw (figure #9). That was a pretty good afternoon’s work, wasn’t it?! Bill: After Dan and I got this new ‘D-Tuner’ design down on paper, we took it to my machinist friend, Loring, to see if he would build our first prototype. He took on the job, and a month later when I was back on tour with Bill Monroe, Dan mailed the first pair to me ( figure #5). While we were on the road, I had a chance to try them out and fortunately they worked quite well. Our tour took us to California where I happened to meet Walt Pittman. After checking out the tuners he offered to make better looking nuts, washers and thumbscrews to replace the ‘off-the-shelf’ hardware that Loring and Dan had installed (figure #5). Bob: When did Earl find out about these new tuners? Bill: Upon our return to Nashville, after the tour, I showed them to Earl. He was quite impressed and wanted to be involved in some way. After leaving Bill Monroe in late December, 1963, I returned to Boston. Encouraged by Earl’s response, Dan and I incorporated some improvements into our 2nd prototype (see Figures #6 and #7). We wanted to make them smaller so that the banjo could fit more easily into its case. We also decided to make the spool on the third string tuner (figure #6) smaller than the one on the 2nd string tuner (figure #7). 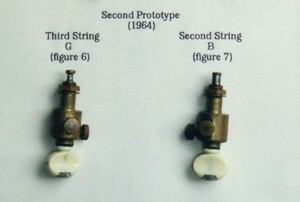 The first prototype had the same spool size for both strings, which meant the 2nd string tuner, lowering from B to A had to be turned further than the third string tuner, lowering from G to F#. So, in the second prototype, we made a small spool for the third string and large spool for the second string. In figures 6 and 7 you can see the difference in spool size. And to finish up the 2nd prototype, I used the nuts, washers and set (thumb) screws that Walt Pittman had made for me. This pair looked great and worked even better than the first pair. So, Dan and I decided to start a business and begin manufacturing them. Bob: How’d you do that? Bill: We formed a corporation in late January, 1964, and I was elected President. I chose the name “Beacon Banjo Company” because of Beacon Hill in Boston and because it reminded me of Bacon Banjo Company, named after Fred Bacon, one of the finest banjo players in the early 1900’s. Now, as a corporation, Dan and I invested a couple thousand dollars and issued ourselves stock. That money financed the run of our first fifty pairs. We got the parts made at a local production machine shop and assembled them in Dan’s garage. As a surprise for me, Dan had a tool made to stamp my name on them. 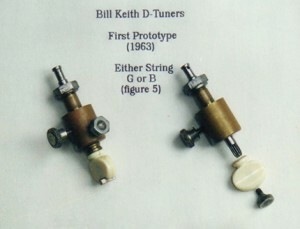 The first few pairs made in the garage were stamped “Keith” on the flat surface of each tuner. Although our first and second prototypes were made of brass, and like most tuning pegs, would have eventually been either nickel or chrome plated, we decided to avoid the problems and expense of plating by making them out of stainless steel — which works just fine. We also decided to make tuners for the first and fourth string, since cam-style tuners couldn’t be installed on those strings. Having tuners on all 4 strings made a lot of new things possible.